I recently got this journal in the mail that I was mentioned in and I think a lot of you might be interested. It's called Signs and is put out by The University of Chicago Press. It is a Journal of Women in Culture and Society. This issue focuses on zines. There are lots of great articles and you can see the listings here. 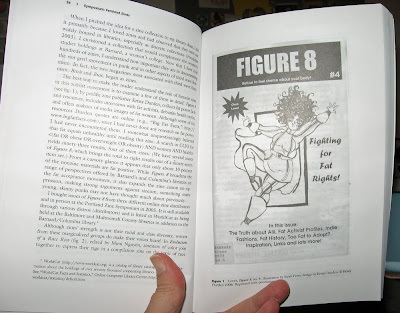 Jenna Freedman, who is a great zine advocate and the zine librarian at Barnard College wrote the article that mentioned Figure 8. It was called Grrrl Zines in the Library. Jenna mentions in the article (click image to make bigger and to be able to read text) that if it weren't for reading zines she wouldn't have come across the information in Figure 8 and would've never thought to question the fat prejudice that is sold as fact everyday. That is really awesome and makes me want to keep doing zines. There are so many great fat books and blogs out there these days, I often feel like maybe I can let Figure 8 go, but things like this make me rethink it. It also is good inspiration for anyone making a zine. Sometimes it's hard to believe that zines can have an affect, especially when you can find anything on the internet in a second. But, there is nothing like having a zine to hold and read anywhere you are. It's less distracting than the internet and a much more intimate experience between you and the writer. And, like with Jenna, it can get into someone's hands who would have never sought out information on that subject. Anyway, yeah, look at me (and look at zines!) in a smarty pants academic journal. Awesome. Thanks for including me, Jenna. That's fantastic, Krissy! I think your blog is definitely still important. You have a great way of presenting the information -- don't count yourself out! BTW it worked at home, too!